The Dragon Age RPG intrigues me. With a lightweight rules system, mana pool-based magic, and a killer background setting, it seems like the sort of game that could help pull me back into fantasy role-playing. After spending a night learning more about the game for a Knights of the Dinner Table column, I decided to order the game. It arrived Saturday afternoon, and I wasted no time in getting to the unboxing. 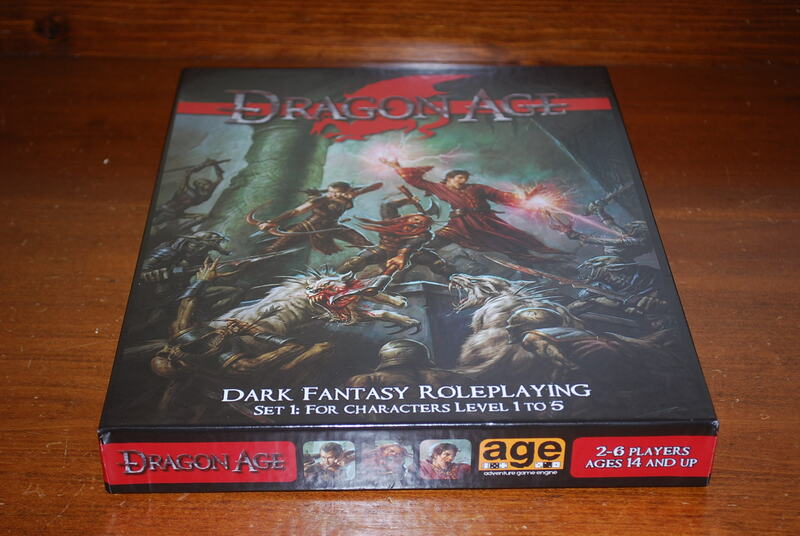 Dragon Age Role-Playing Game: Set 1 comes in a boxed set, just like some of my favorite role-playing products of all time: Dungeons & Dragons, Star Frontiers and Gamma World and DC Heroes. 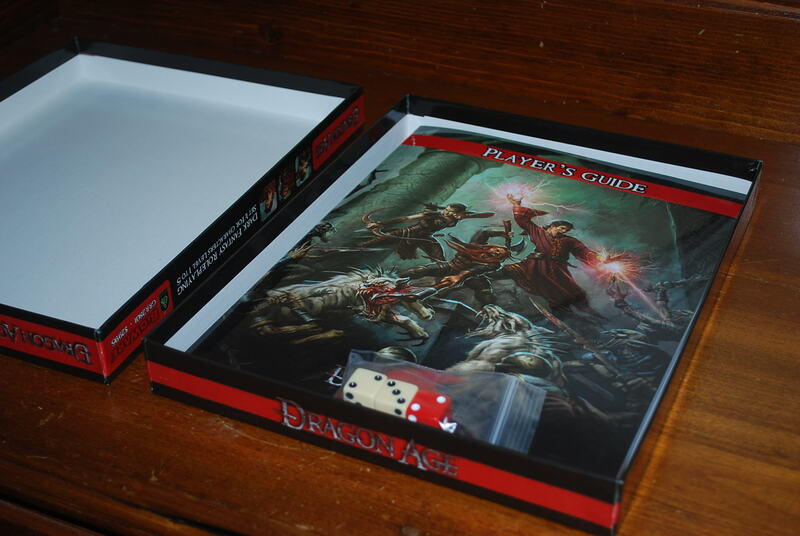 The form factor mirrors that of the original D&D Redbox (rather than the much beefier box for the new Gamma World game that Wizards of the Coast released in 2010). It feels a little more substantial than those boxed sets of old, but that could be entirely my imagination. I can’t do a side by side comparison because none of my boxed sets survived my early RPG days, falling to the fate of all such collections as they were crushed by hardcover books, impatiently rammed together during study hall, or accidentally dropped down stairs. I can’t say out the Dragon Age: Set 1 would hold up to such punishment, but at age 39, I’m not inclined to find out. Suffice it to say that the box seems sturdy enough, and it made that immensely satisfying “sweeee-it” sliding sound as I let the bottom of the box fall away from the top. Inside, I had happy flashbacks to the D&D Basic Set as I saw a set of three six sided dice — two white, one red — sitting atop the Player’s Handbook. Beneath it were more memories. After lifting the Game Master’s Guide out of the way I found a folded up map of Ferelden, the starting region for the game. While not as big as the two maps that came with the original World of Greyhawk boxed set, I couldn’t help but think back to it and the many years those maps spent hanging on my wall. Fully unpacked, Set 1 met my expectations. While it does not have the monster tokens or battle maps that you’ll find in the Dungeons & Dragons 4E Red Box, Dragon Age has something you won’t find in D&D’s boxed offering: a complete game. 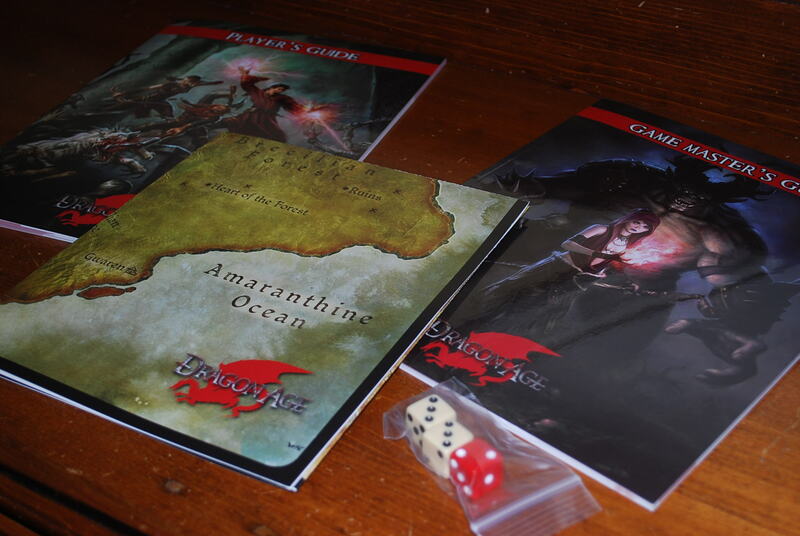 The full contents of the box are: the players guide, the game master’s guide, a map of the Dragon Age world, and the dice. Credit: Ken Newquist. The D&D Red Box is meant strictly as an introduction to the larger D&D line. It has a choose-your-own-adventure style character creator, but once you’ve made your character and played through the first adventure, you need to move on to the Rules Compendium, Player’s Handbook 1 or one of the new Essentials class books. True, you can play through the Red Box multiple times, but you’ll be revisiting familiar ground. Dragon Age: Set 1, like the original, ancient D&D Red Box, gives you what you need to start playing the game … and then keep playing it through level 5. It can be argued that the two games fill different niches — the new D&D offering fills an introductory niche, while Dragon Age, with its dark fantasy setting, is geared toward an older, more established audience. That said, the bigger issue is likely one of space: D&D 4E requires a hefty page count in order to cover four classes, even if you’re only doing levels 1-3. Dragon Age is a far simpler, more streamlined game and that allows it to pack its rules into two slim tomes. The pity is that Gamma World shows you can create a condensed version of D&D 4E and pack it into an all-inclusive box. But I digress. I’m reading through the Player’s Handbook now, and enjoying it greatly. The game reads fast, and the task resolution system seems like it will fit with my gaming group’s play style. I particularly like how rolling doubles can trigger stunts, allowing players to perform exceptional moves. The magic system — in terms of spells and magic items — is a little light for my tastes, but I expect Set #2 will help in that regard. I’m looking forward to rolling up some characters and putting together a playtest.